Have candy? Peanut butter? Some apples? Random candy?? Have we got the snack activity for you! 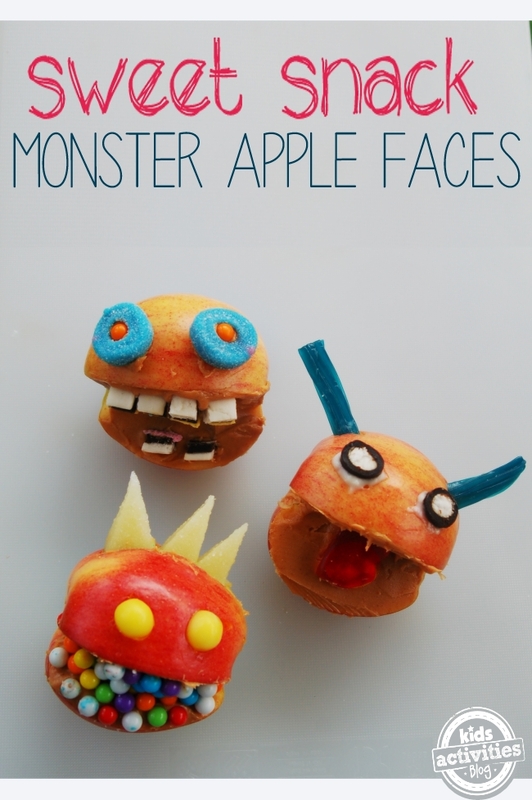 Super silly, absolutely tasty, Monster Apple Faces. During the kids birthday party we had a candy buffet for the kids to decorate their own cupcakes – it was a huge hit! But really, we should have just skipped the cake and had the kids make these! The Apple Faces would be a great alternative to a birthday “cake” for families with gluten intolerance! What did we use to create our faces? Apples, carrots, cream cheese, peanut butter, coconut shavings, sprinkles, nerds, jelly beans, nerds, yogurt covered raisins, cereal, gummy worms, licorice bits, and more! Cut slightly less than 1/4th of the apple out, and core the remaining portion. This will be the apple’s “mouth”. 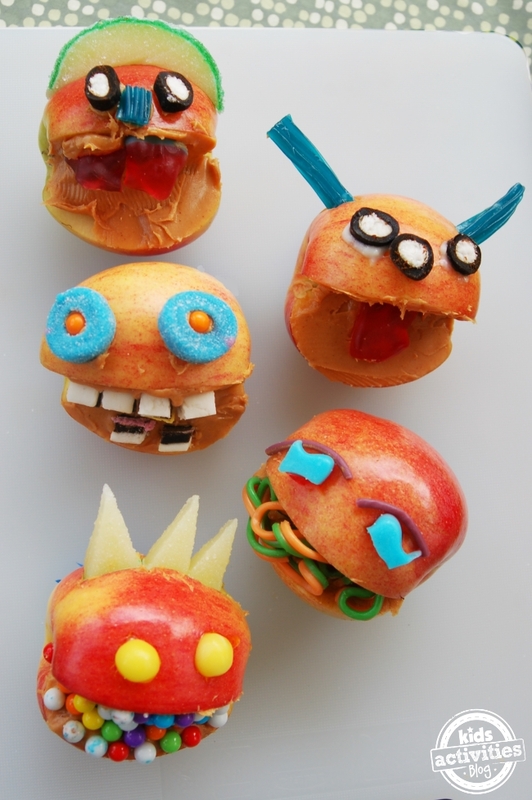 Add something sticky to coat the mouth of your apple – we used cream cheese and peanut butter, but I bet nutella would be great too! We made some with horns, some apple monster faces with worms crawling out of their heads, and of course, lots of crazy eyes. 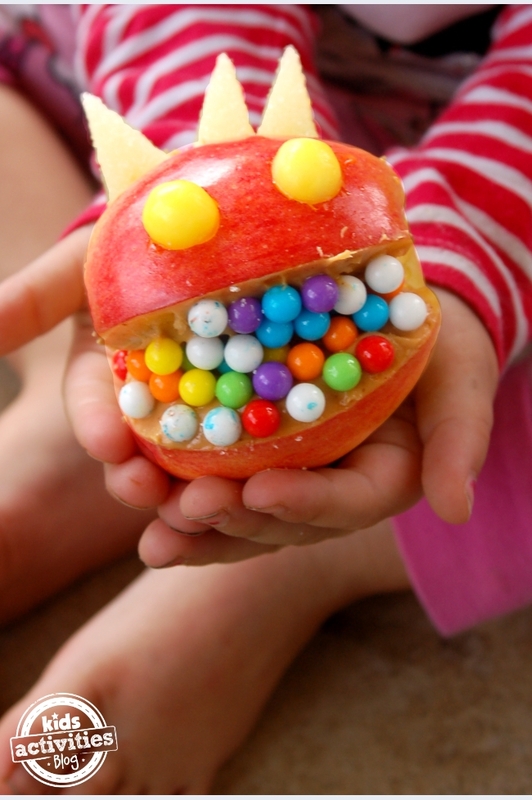 These were a hit with my preschoolers..
Have you played with your food? Or done an activity with monsters? Let me know! I’d love to feature you in an upcoming post! These would make JDaniel laugh. Oh man, I can’t really bare to watch these stuff. I’m ready to gobble them up…. I usually like my apples plain and no-fuss but this is just irresistible! Omigoodness- those made me giggle! What a fun and inventive way to get your kids to eat their vegetables. What funny! OMG! These are just too adorable! So cute! this is genius! I love playful food! PINNED! These are the cutest treats. I love them. I will be trying some out with my kids. I love these treats. They looks so yummy. Those are so stinking cute! They would be fun for a school Halloween party, too. These are seriously cute! Pinned!!! Thanks for the idea! Such a cute idea. 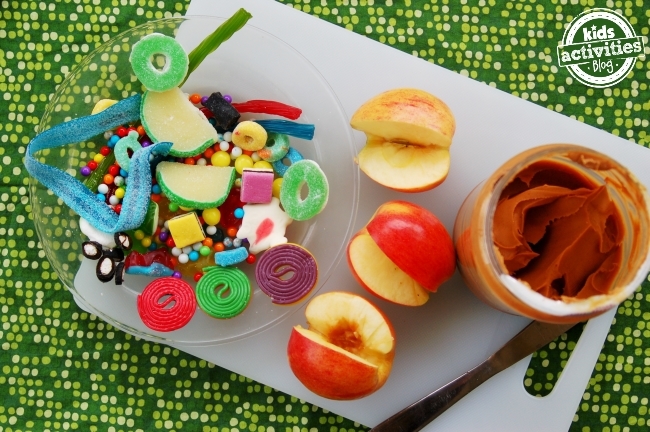 Great way to use left over candy, since a candy holiday is coming up! I am delighted to feature this food craft idea on Mom’s Library at Pounds4Pennies this week. These are the cutest things ever. My oldest would go crazy for these and they’re simple enough that I would actually let her put them together herself. Great edible craft post, thanks for sharing and for linking up with us over at Tell it To Me Tuesday!